In ventilated tunnel fires, smoke and hot combustion products may form a layer near the ceiling and flow in the direction opposite to the ventilation stream. The existence of this reverse stratified flow has an important bearing on fire fighting and evacuation of underground mine roadways, tunnels and building corridors. In the present study, conducted by the National Institute for Occupational Safety and Health, a CFD program (fire dynamics simulator) based on large eddy simulations (LES) is used to model floor-level fires in a ventilated tunnel. Specifically, the critical ventilation velocity that is just sufficient to prevent the formation of a reverse stratified layer is simulated for two tunnels of different size. The computer code is verified by checking the computed velocity profile against experimental measurements. The CFD results show the leveling-off of the critical ventilation velocity as the heat release rate surpasses a certain value. At this critical ventilation, the ceiling temperature above the fire reaches a maximum for both tunnels. The velocity leveling-off can be explained from this observation. An extended correlation of Newman (Combust. Flame 57 (1984) 33) is applied to the temperature profiles obtained by CFD. At the critical ventilation, temperature stratification exists downstream from the fire. 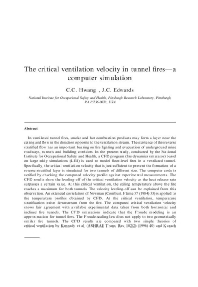 The computed critical ventilation velocity shows fair agreement with available experimental data taken from both horizontal and inclined fire tunnels. The CFD simulations indicate that the Froude modeling is an approximation for tunnel fires. The Froude-scaling law does not apply to two geometrically similar fire tunnels. The CFD results are compared with two simple theories of critical ventilation by Kennedy et al. (ASHREA Trans. Res. 102(2) (1996) 40) and Kunsch (Fire safety J. 37 (2002) 67).